The process of quote solicitation for Devil's Cape was translucent for me--in other words, I know enough about how it worked for light to filter through, but wasn't privy to enough details to give a completely clear picture. Here's what I know: Wizards of the Coast asked me for a list of people/institutions who I thought might be interested in reading advanced reader copies (ARCs) of the book and providing comment, both for review purposes and for promotion. I thought hard about it and provided a list, and I'm not quite sure what happened next. Certainly Wizards sent the book to people I didn't list (and that's a very good thing). Some of the people I listed didn't get books and some did--I'm not sure exactly how that worked. Anyway, one of the people I thought might be a good contestant to review the book and comment on it was Greg Rucka, the comic book and crime writer behind Whiteout, the Atticus Kodiak novels, Checkmate, and lots of other good stuff. There is NO WAY that this is Rob Rogers’s first novel. This is a novel replete with the rewards of a lifetime of training, effort, and passion. Devil’s Cape is a mesmerizing, seductive, and darkly moving piece of fiction that seamlessly, even gracefully, marries tactile reality with myth and magic to bring its own pulsating world to life. 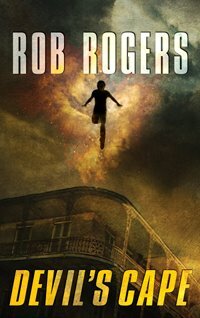 Beyond expectations, full of surprises, singing with resonance and emotion, Rogers has written a novel that first stabs the superhero genre in the back, then flips the body over and shocks it back to exhilarating life. What arises from this crime scene is a post-modern delight. Take the tour of Devil’s Cape—I guarantee you’re going to like it here! I'm obviously pleased with the quote and it's particularly exciting to me that it comes from an author I've enjoyed and admired for years. Thanks, Greg Rucka. Everyone reading this--please go check out a few of his books. I know you'll enjoy them. That's a great review and I like Rucka's current work with DC Comics! Congratulations! What a great quote. Come see me (and Devil's Cape) at CAPE! Bring me the Sci-Fi Dine-In Theater on DVD!